The olde Mr Simms sweet shop sat on an unassuming corner on Spring Garden Lane. It’s a good location, just next to QRE and Hopewell Center, across the road from the jockey club gambling ticket office (not sure if this is the right description for it). The sign didn’t really stand out though, and when I went in once looking for a particular item, the shop girls in there were unnecessarily terse with me. So despite it’s appealing window displays and witty blackboard signs left on the pavement, I never went back in. The irony of its replacement was not lost on me. 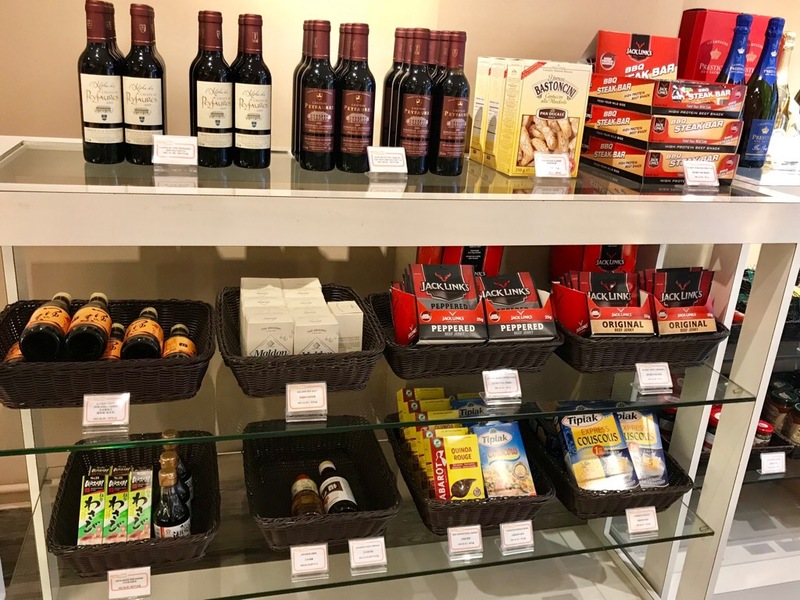 From a candy shop that stocked almost every coloured additive to a great deal of sugar and possibly a similar amount of starch and flavouring, the space has now become a GP clinic. 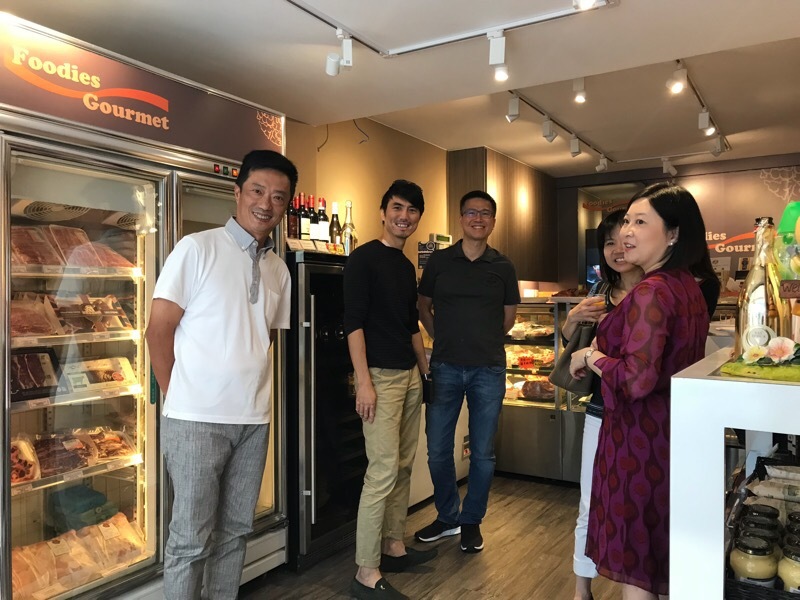 It’s too bad that Wan Chai is losing diversity in shop choices… perhaps Okashi land is drawing most of the crowd. 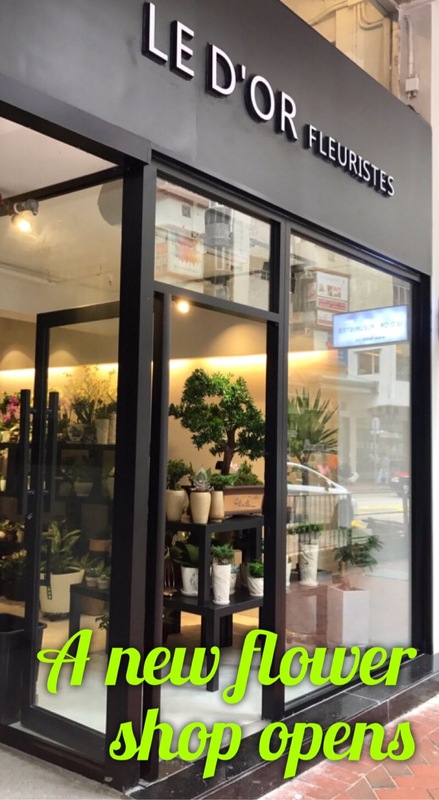 Will the Mr Simms sweet shop move elsewhere in Wan Chai? I’m guessing that the GP will make more money in the long run. 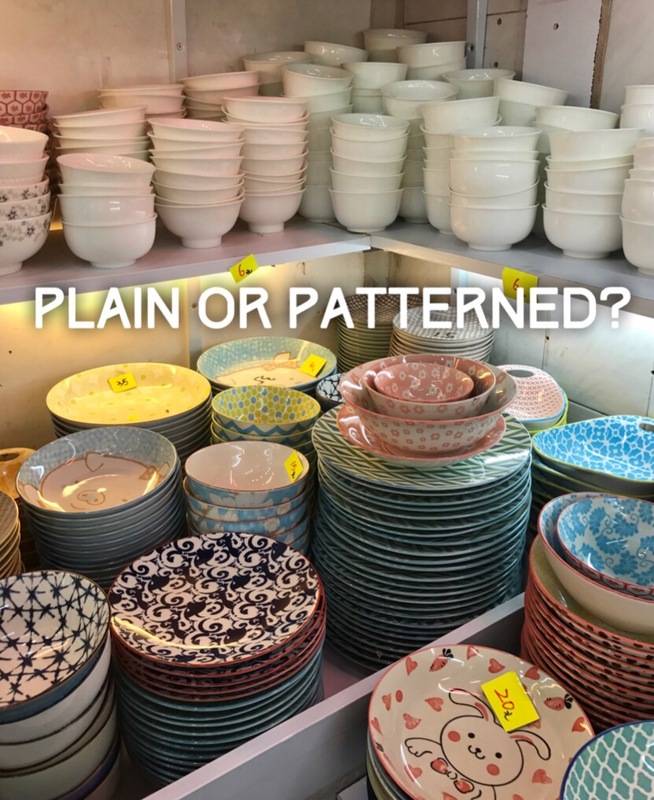 It seems these ceramic pop up shops are very popular.. not surprising given that there are so many patterns and shapes of dishes to choose from. 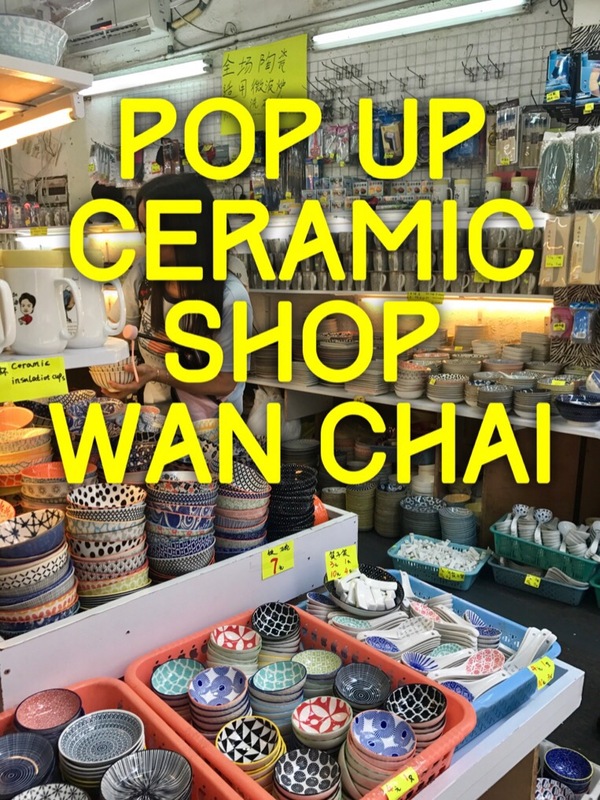 This pop up shop is here for the month of April 2018, but if you really need some ceramic ware, get there soon as they only stay as long as the landlord doesn’t find a longer term tenant. The shop looks like this. 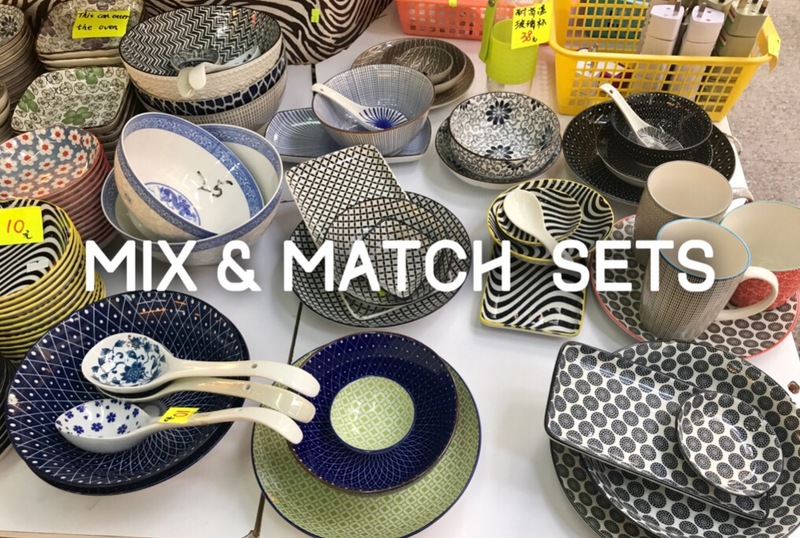 It sells the ceramic ware but also a mish mash of household items. What’s for sale…. 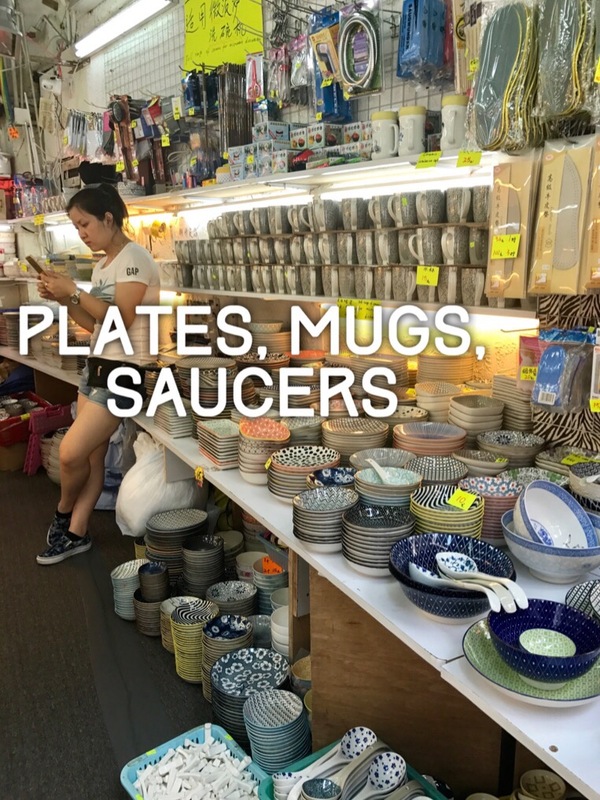 plates, saucers, bowls galore… here are the pics so you can plan your purchases and self brought bags to cart it all home! Why don’t corporate websites publish their opening hours? Geez. 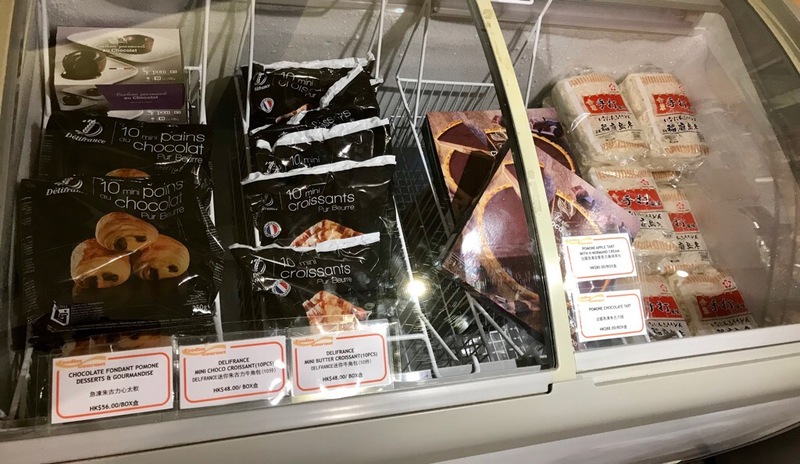 Ok so rather thanks ttidisappoint a four year old, I checked that the local fruit shops didn’t have anything similar (ok they had the Japanese Mikan xxrgr fversion at twice the price) and hopped on a bus to the nearest M&S food hall. I recalled that opening hours were later on Sundays and public holidays than the rest of the week but I couldn’t remember if it was 8am instead of 9am or 10am instead of 9am. I looked up their website only to find this. Hmm. Ok address yes but no opening hours. Urgh. Am I going to wait around for an hour or get there just on time? It was 8.45am on a Sunday morning and I waited 17 minutes. The auto glass doors rolled open for me at 9.02am and two other waiting women (who arrived just after I did). I picked up 3 packs of easy peelers and 1 pack of Satsumas at 49 HKD each. Three freshly baked croissants at 13 HKD each. The clementines were a hit with the kids on our hike, I distributed them at the summit and the wonderful perfumed scent of small citrus fruits filled the air. So now you know when the opening hours are for M&S in Queens Road East..! 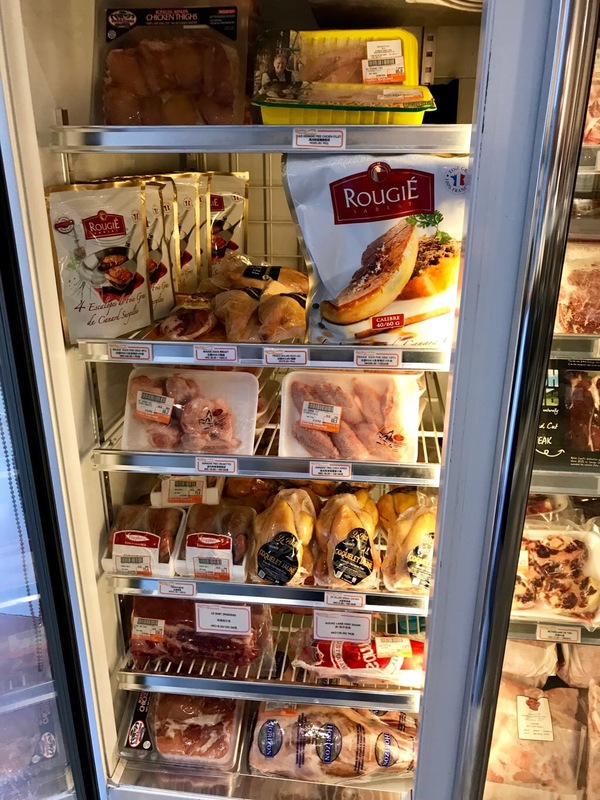 Derek chose a beautiful autumn afternoon to launch his newly renovated shop selling imported meats and a few new accompanying products. He’s retained the same brand name Foodies Gourmet. See what you can buy! The space is a little smaller but he’s somehow managed to pack more into the fridges. He had a wonderful spread of canapés which included German sausages, some caviar on a small vol-Au-vent, roast suckling pig, steamed chicken, smoked salmon on crackers and figs with various deli hams. Fresh juices quenched the thirst and made all the canapés taste better. Thanks for the delicious snacks Derek! Derek is moving towards a delicatessen style of shop, he’s got the dried goods and some nice meats in cans and jars. The shop has a false wall behind it where their back kitchen sits. 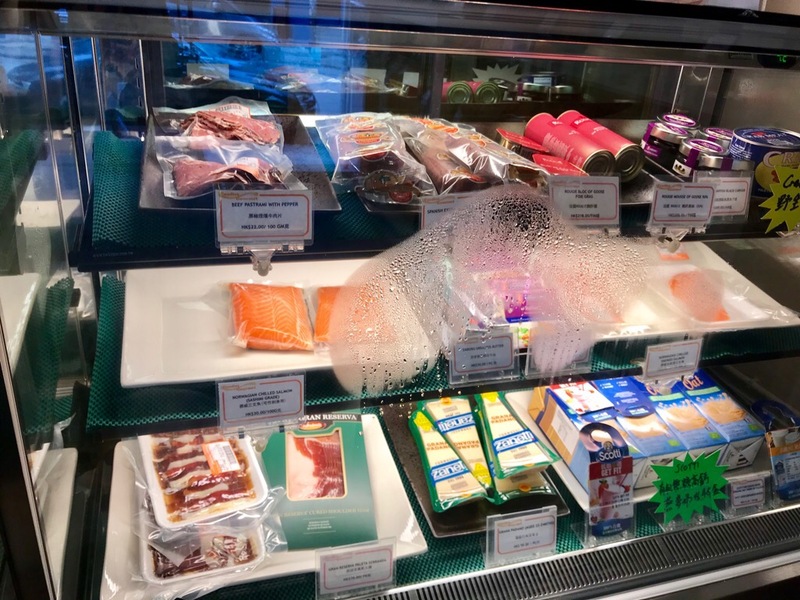 It’s too bad that we can’t see the sink and cutting table anymore, I rather enjoyed watching the sushi master (Derek) prep the salmon and wash his knife and boards… just gives you confidence in the cleanliness. Oh well. 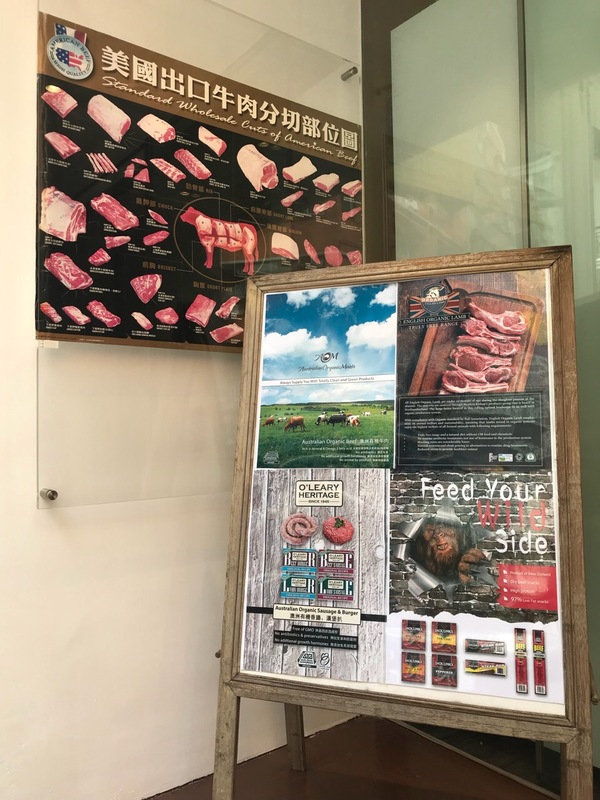 I forgot to take photos of the canapés, but here are the meats and accompaniments he sells in his shop. 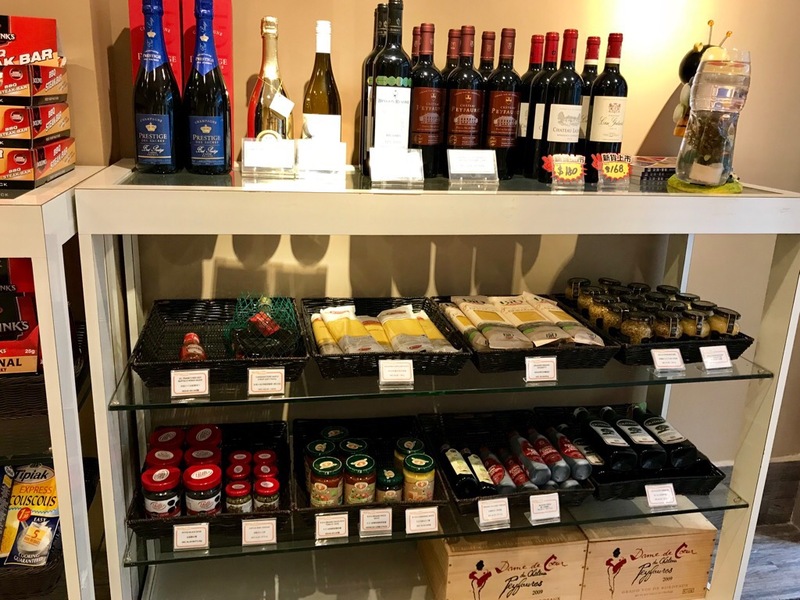 On the right as you enter are the dried goods. 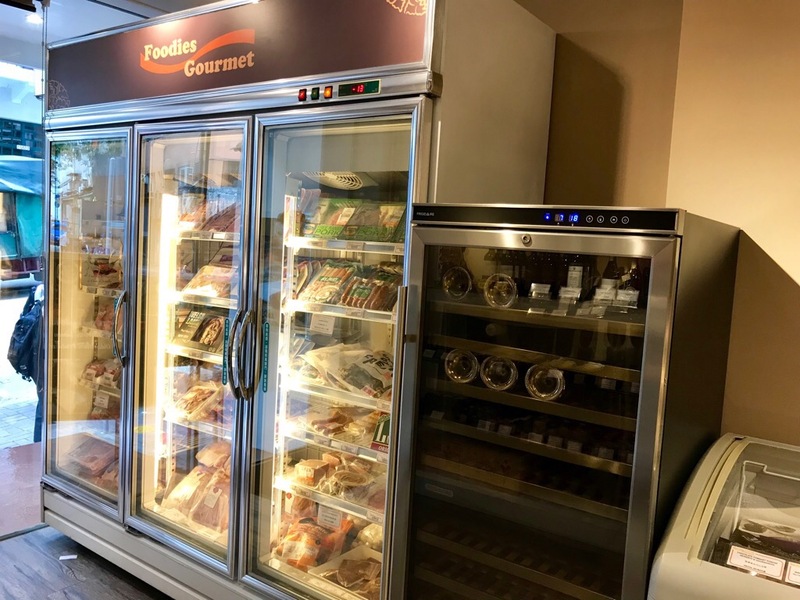 On the left, he’s filled it wall to wall with freezers. Then he’s got a small chest type freezer for the carbs. 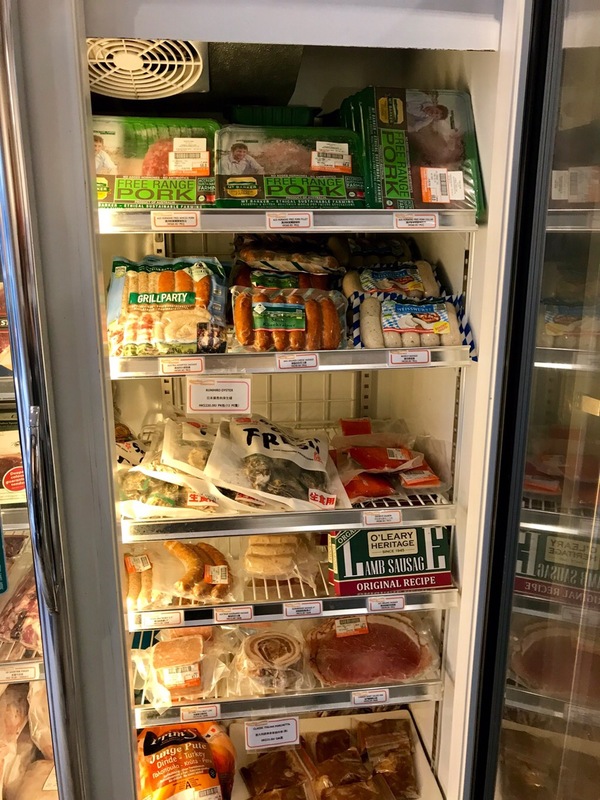 And of course the chilled meats section where you can buy top grade Japanese beef, New Zealand lamb and Norwegian salmon. 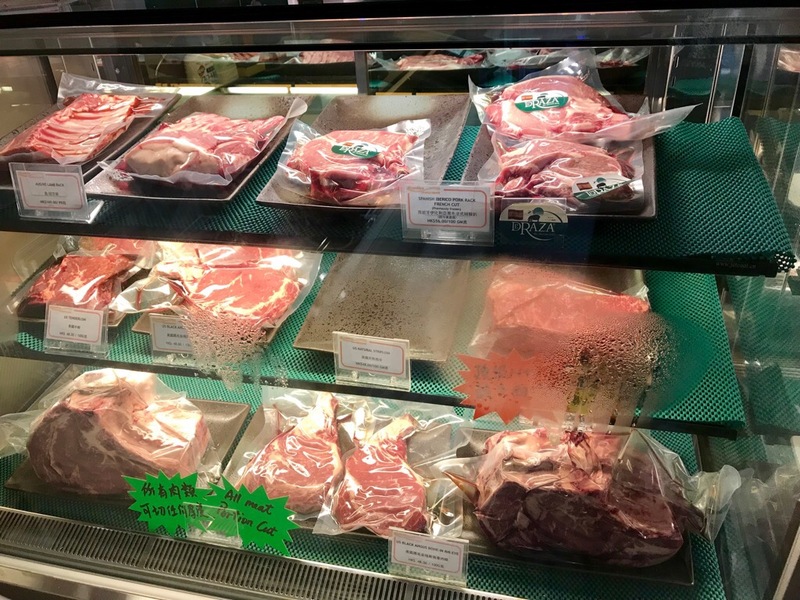 Derek is super helpful and will marinade your meat for you with advanced notice, so that all you have to do is bung it in the oven or pan fry it to perfection. He’s taking orders for his specialty, baby turkey for thanksgiving or Christmas. It takes 10 days advanced notice for best results. He’ll defrost it thoroughly and marinade it with his special seasoning and heat seal it all in a bag for you to take home. I bought one last year, it fed 5 people and was perfect in the oven with Derek’s instructions. Tasty, tender and thoroughly recommended. Yes, you can tell I’m a satisfied client. Find him on Stone Nullah Lane, more or less opposite the Blue House and Samsen. 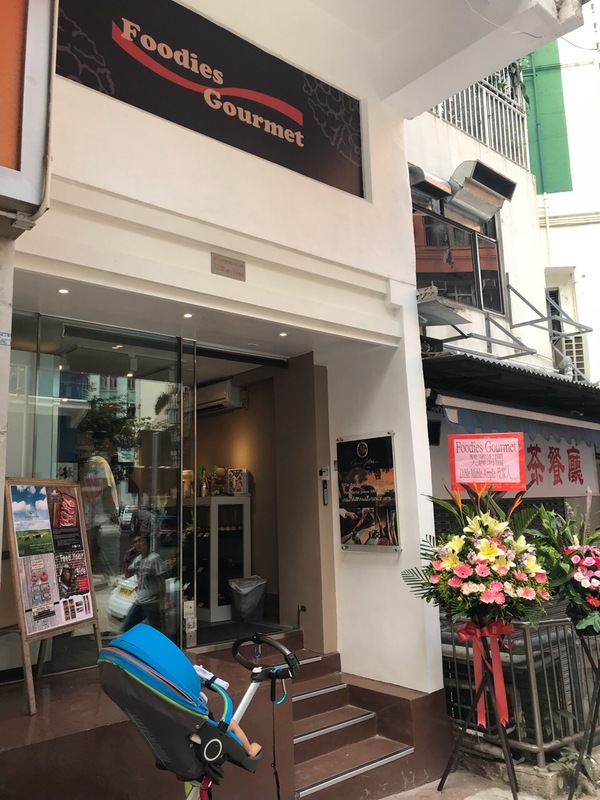 It’s across the street from those two, between a school uniform shop and a hk style coffee shop. Update: it is now September and the ceramic shop lease has run out. They are no longer here. It is now a sock and towel shop for a few months! 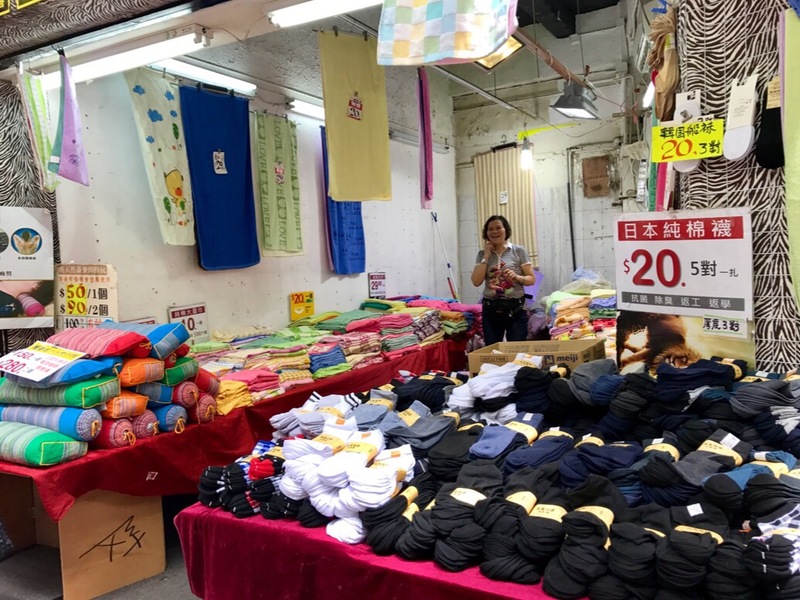 As stores vacate their spaces due to rent or other business decisions, landlords keen to keep the space in use and tenanted seem able to lease them out for short periods of time. It’s almost like an Airbnb for retail. The tenants rent by days til their goods are sold or by month until the landlord finds a long term tenant. It keeps the neighbourhood lively and interesting… there’s never a shop shuttered for too long. 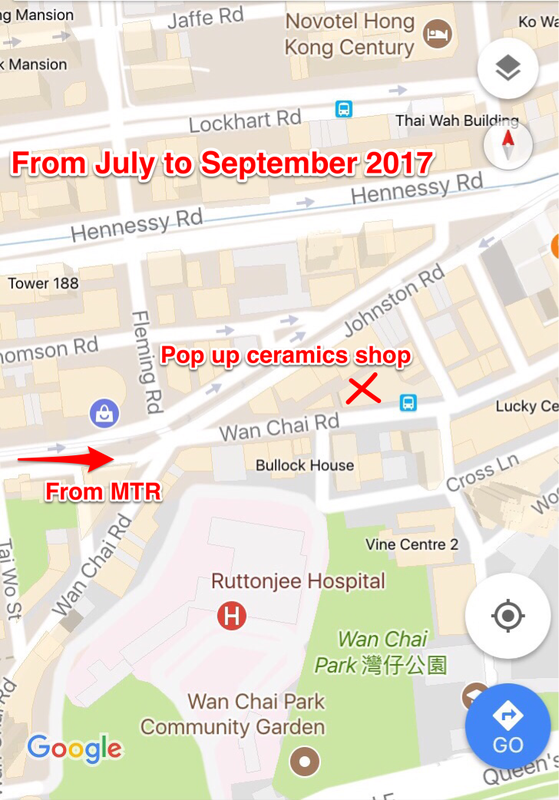 Ceramic shops seem to do fairly well as pop up stores, fragile but non-perishable. Here’s one that appeared on Wan Chai road last month. 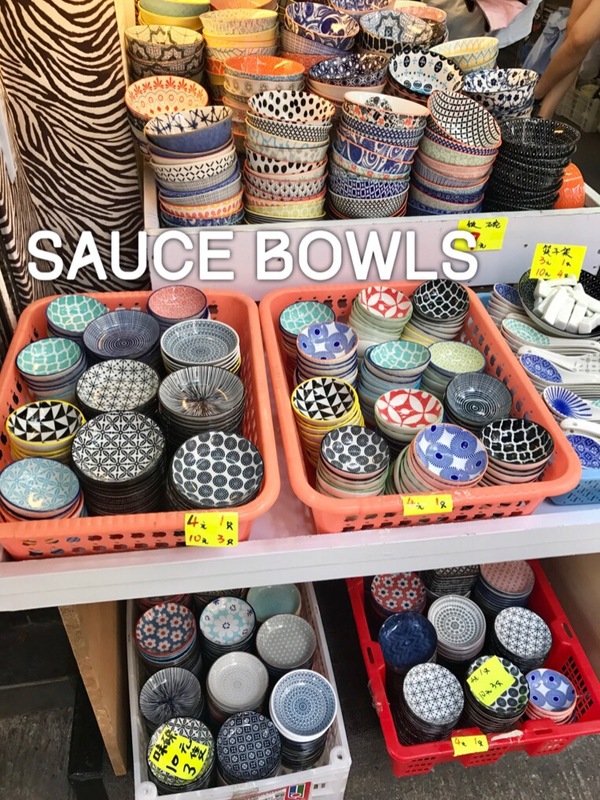 Matching sauce bowls and soup spoons. All in pretty patterns. Chopstick rests and dipping bowls. Mugs and other random household items. 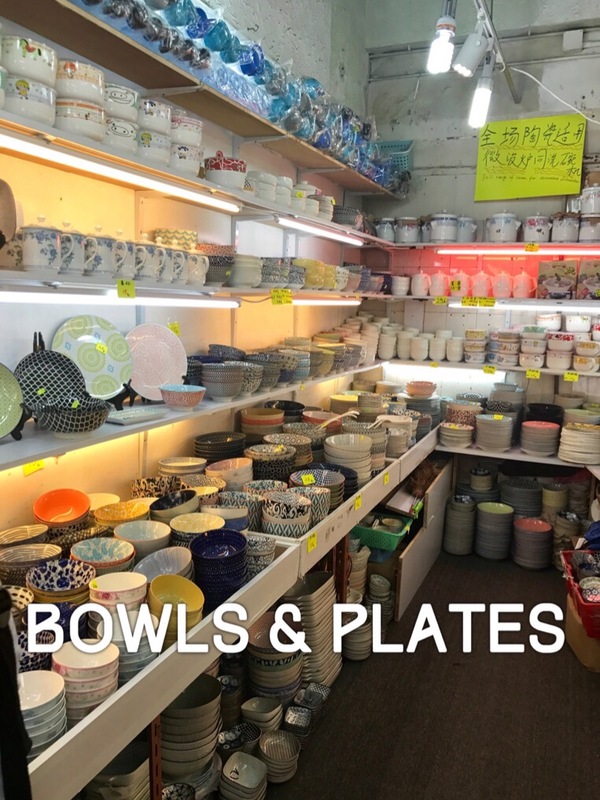 Lots of plates and bowls. 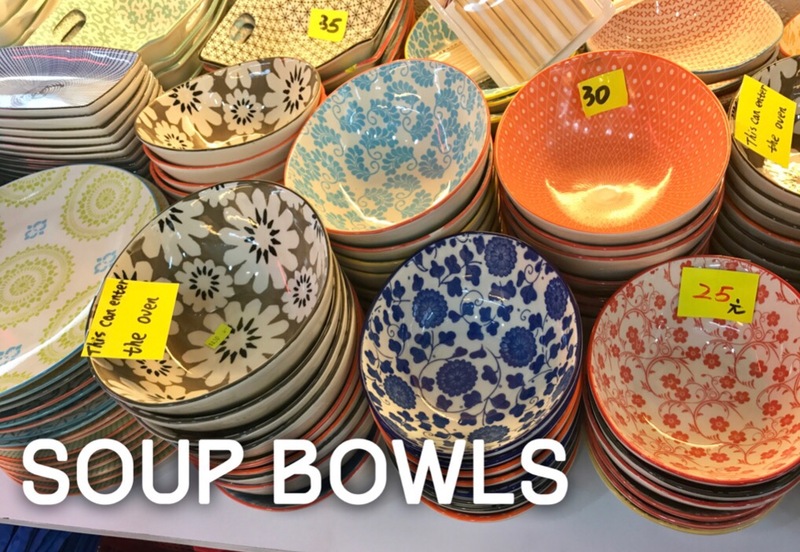 Small soup bowls in various colours and prints. 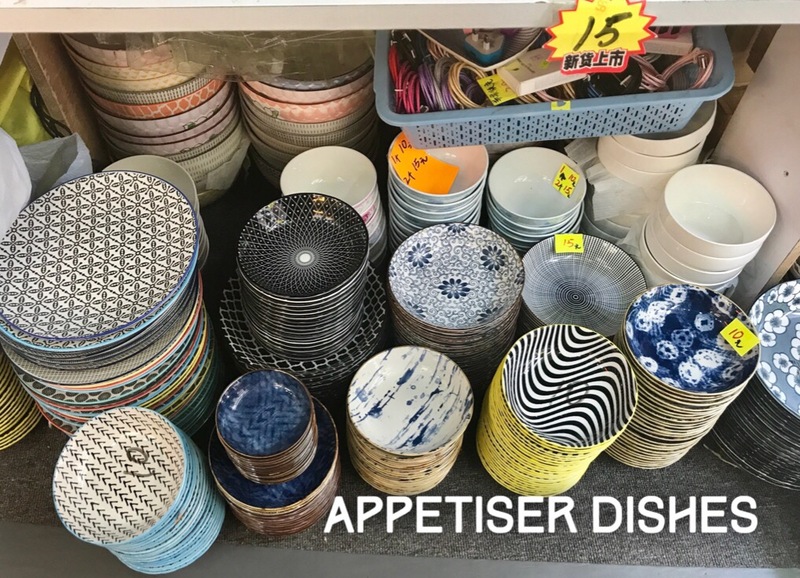 Small dinner plates and heat tolerant dishes for baking. 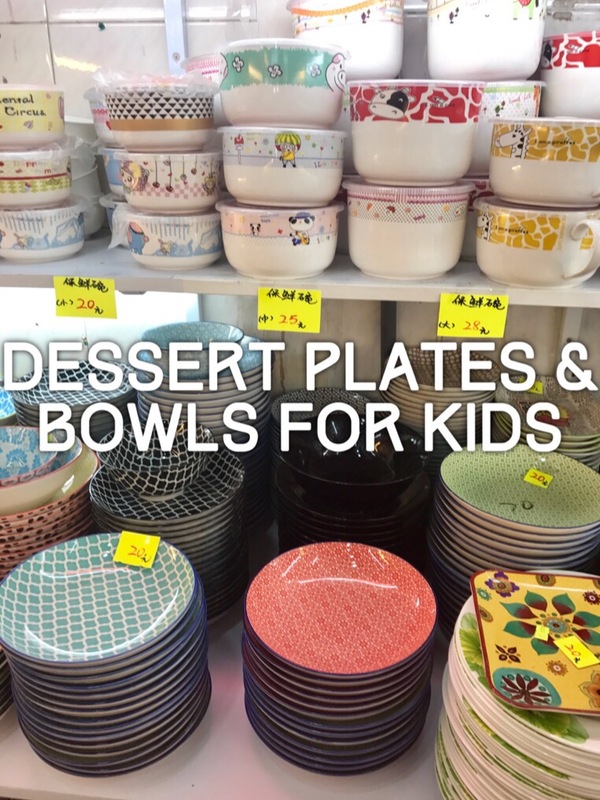 More plates and bowls with lids for kids. They also have plain white crockery. Then I spied more appetiser dishes.. Suggested pairings for your dining set. 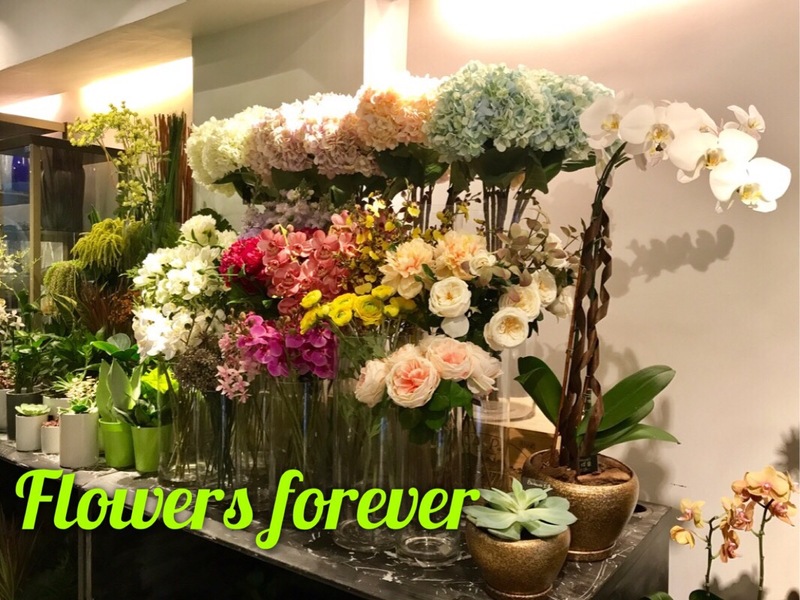 It wasn’t long ago that my favourite flower shop left Wanchai and is now under renovation to become something else. 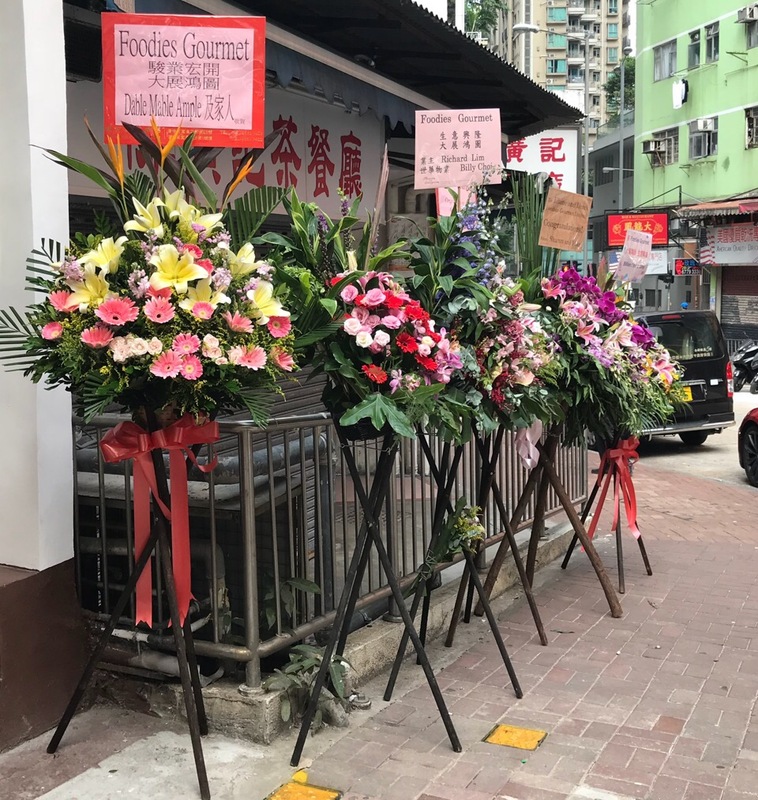 The usual frenetic and unforgiving pace of commerce in Wan Chai due to escalating rental. 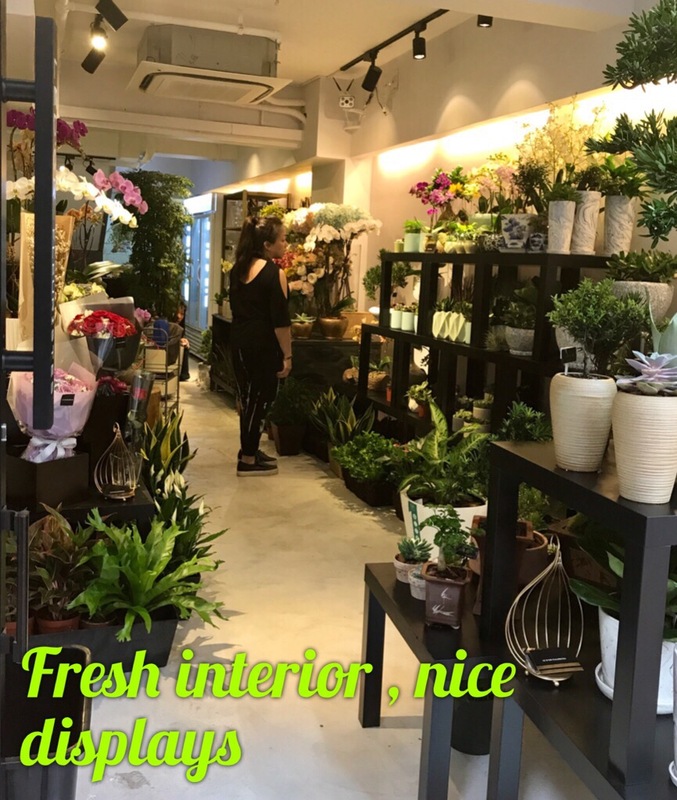 I came across a new florist shop last week along Queens Road East that looked more like a fashion designer store than a florist. 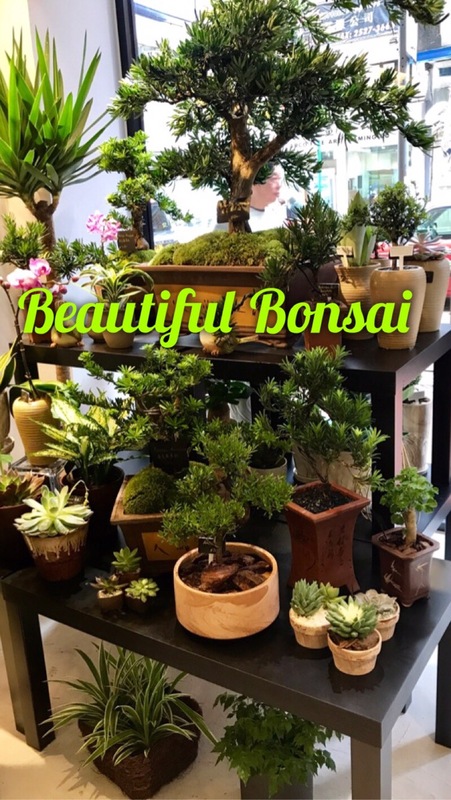 Here are some photos, I spent a good 15 minutes browsing around. Done in a simple but nice black and white full glass frame with an open door, the shop looks very inviting. Nice clean concrete floors and layered black shelving help to showcase the plants and flowers for maximum effect. I like the recessed lighting and spotlights that match the shelves. They do nice big bouquets if you’re looking to impress a date, but I’m sure they can fix something up for you on request. 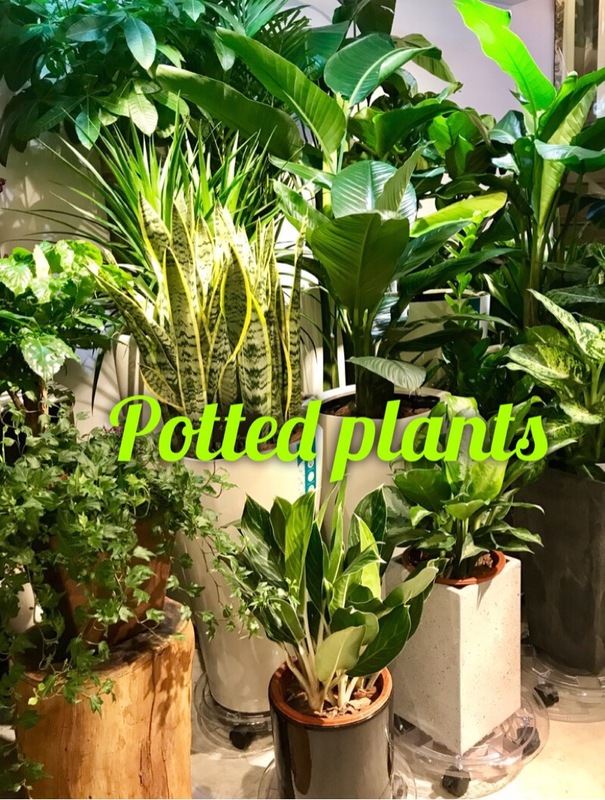 The selection of potted plants is nice and healthy. 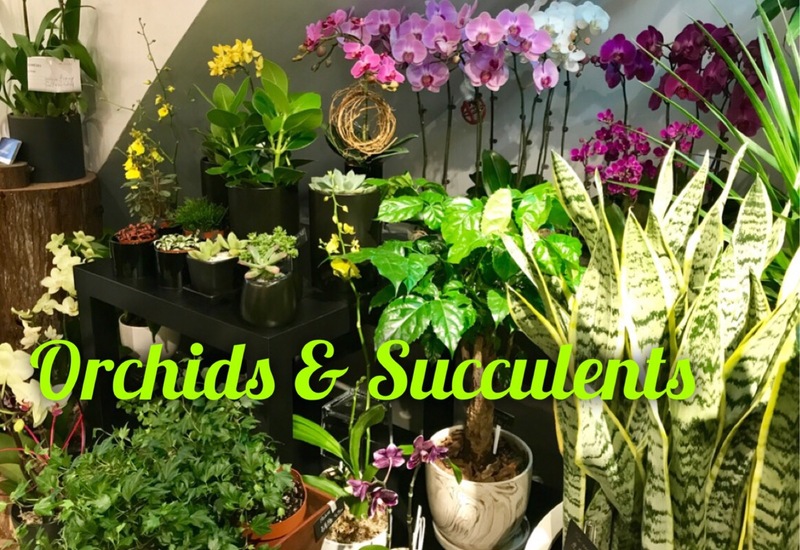 As do the orchids and succulents. 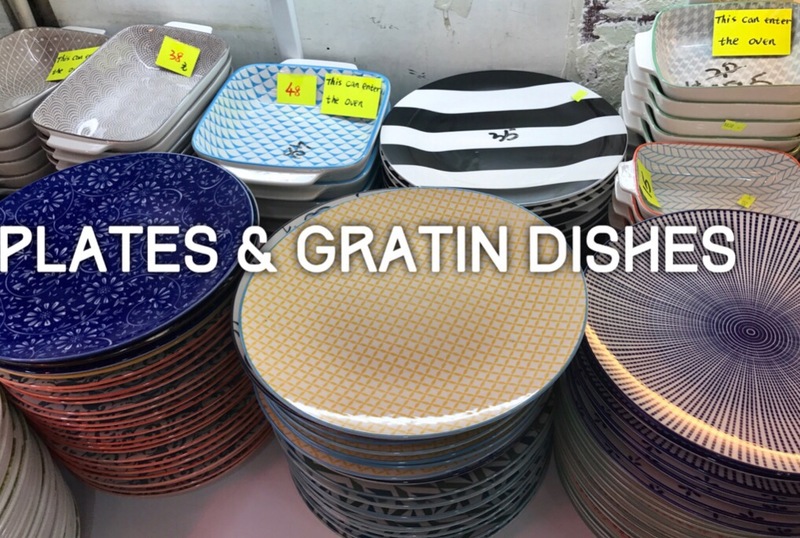 There’s something to suit every table and counter top. 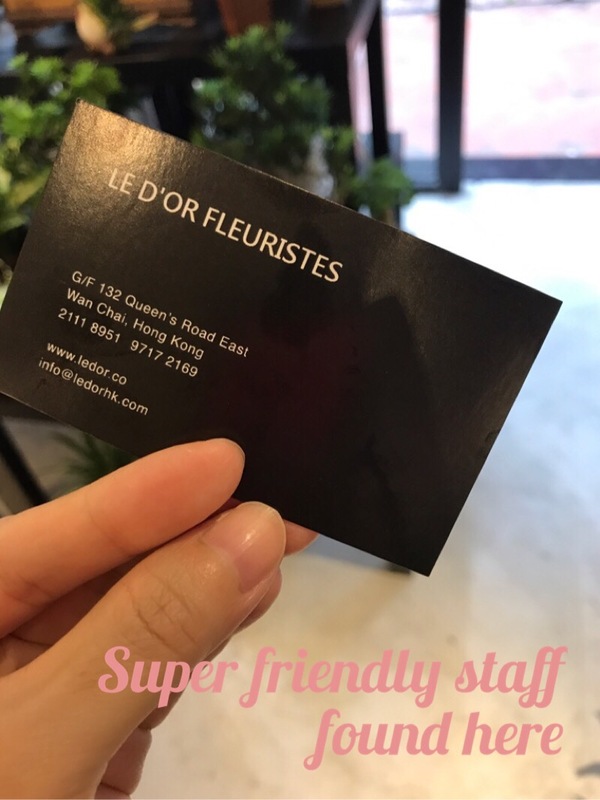 I picked up a card when I realised that I had met the sales lady before in the other flower shop that I like. Both ladies in the shop are super nice and very helpful without being intrusive. You really feel like you can talk to them about anything. They also have some artificial flowers which look amazing. I was quite impressed. It is similar in quality (or perhaps better) to the big scale florist at Hopewell Center but this look a lot easier to scan and decide. 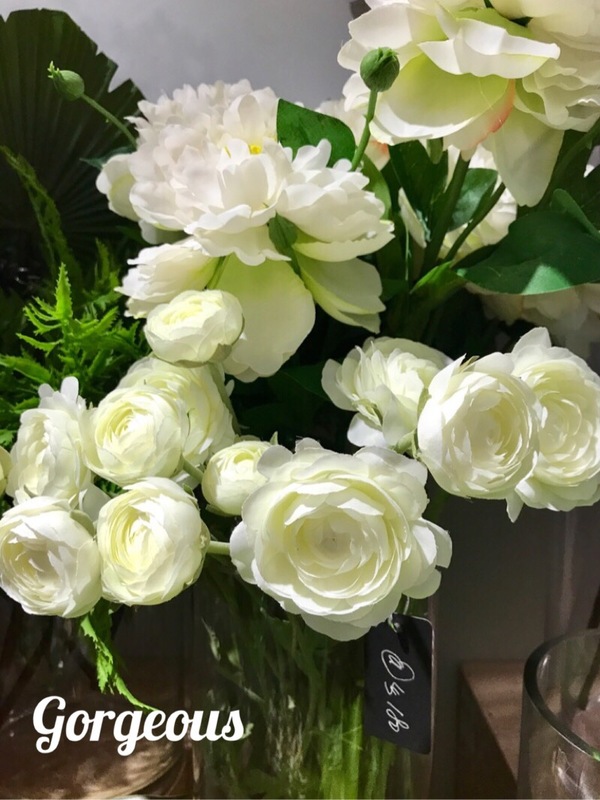 Yup, these white roses are also artificial but they fooled me until I realised there was no water in the vase. 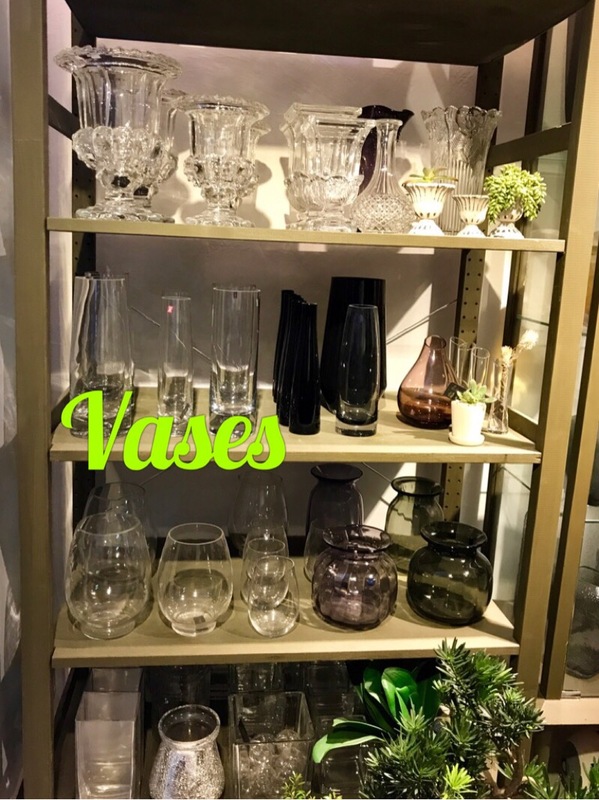 Speaking of vases, they have a small selection. And at the very back of the shop, a fridge for the fresh flowers. 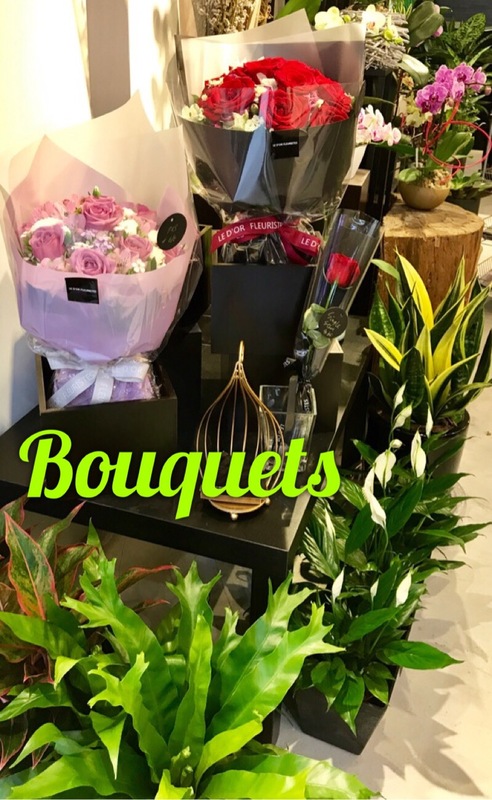 If you have a particular plant/ flowers you’re looking for, do contact them by phone or email. 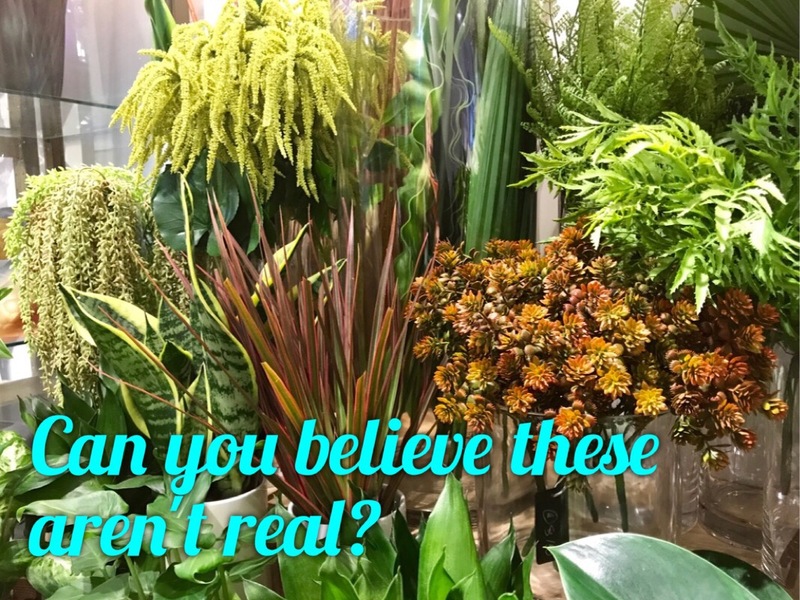 I think they can source the plants if unavailable in the store. Find Le D’or here. 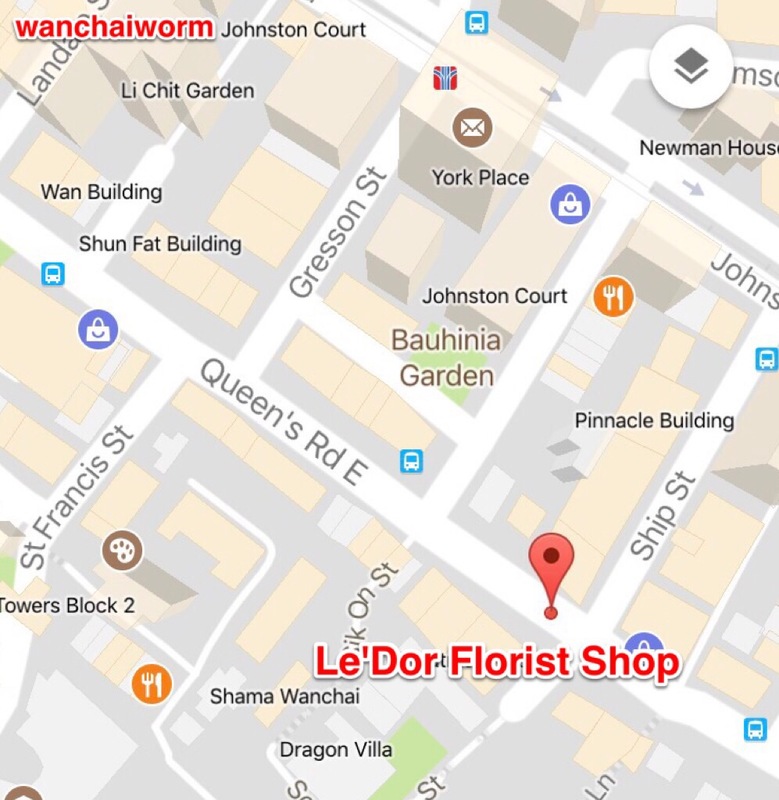 It’s a 5 minute walk from the Wan Chai MTR or catch any of the 6 buses, 15, 10, 109 or 113 and get off at Lun Fat Street. The owner is an artist, don’t forget to stop and admire the two intricate paintings by the entrance of the shop.